Getting to Aachen is easy by car, train, bus and plane from other parts of Germany, the UK, Belgium, The Netherlands and Paris. 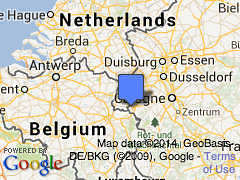 Aachen (Aix-la-Chapelle) is in the far western parts of Germany close to the borders with The Netherland and Belgium. It is also the closest significant German city to Britain. Aachen is on major transportation routes making it easy to reach by road or train. Maastricht-Aachen Airport (MST) is only minutes away but several major airports, including Düsseldorf and Frankfurt, are within reasonable distance. High-speed ICE and TGV Thalys trains are available for fast direct trains to Cologne, Frankfurt, Brussels and Paris. Connections are possible on the Eurostar trains or Eurolines / National Express buses from London. Driving to Aachen is easy from most parts of Germany and Western Europe. Aachen is the westernmost German city only a few kilometers from the Dutch and Belgian borders. Cheap flights to Maastricht Aachen Airport (MST) in The Netherlands are limited by the small number of destinations served from this regional airport. Low-cost Ryanair is the main carrier at Maastricht Aachen Airport (MST) and does provide flights to amongst others London, Dublin, Milan, and Venice. 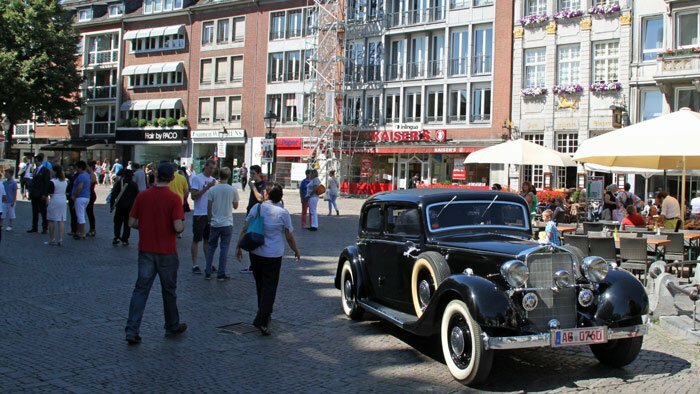 Transportation options from the airport to Aachen are plentiful and fast with driving taking only half an hour. More flights are available to other main airports that are within reasonable distance from Aachen. Düsseldorf (DUS) and Frankfurt International (FRA) airports are both linked by direct trains to Aachen, with the traveling time as fast as 90 minutes when using the ICE trains from Frankfurt. Brussels Airport (BRU) and Cologne-Bonn (CGN) airports are also sensible options. Public transportation is possible but more complicated when using other small airports favored by low-cost airlines such as Brussels-Charleroi, Weeze, or Hahn. Aachen has very good rail links to Germany and the rest of western Europe. High-speed ICE and TGV Lyria trains pass frequently through Aachen giving fast direct trains from Aachen to Paris, Brussels, Cologne (Köln) and Frankfurt am Main. Direct trains are also available from Aachen to many Ruhr cities including amongst others Düsseldorf, Düsseldorf Airport, Duisburg, and Essen. Endless connections to all of Germany are possible from Cologne. ICE and Thalys TGV trains offer the fastest trains to Aachen but are more expensive and TGV trains usually requiring a seat reservation. Regional trains (RE) are slower but cheaper and the Schöner Tag Ticket NRW (direct link to buy from Deutsche Bahn, in German only) and other discount group tickets for local transportation may be used if traveling only on slower trains within North Rhine Westphalia or Germany for some tickets. Train timetables and reservations are possible at German Railways website – advance reservations can give huge discounts. Direct Eurolines / National Express coach services are available to Aachen from amongst others London (10-12h), Paris (6h), and Brussels (2h) with many further connection services available too. Buses are slower than trains and less comfortable but especially at peak times, bus tickets may be far cheaper than full-fare train rides. Deutsche Touring has a few services available from Aachen to Düsseldorf, Essen, Dortmund, and Münster. Travelers planning on using cheap long-distance buses in Germany will have to take the train to Cologne first. The top sight to see in Aachen is the cathedral (Aachener Dom), which at its core has the octagonal palatine chapel of Charlemagne. The Carolus Therme is a popular hot spring day spa at the edge of the old town center of Aachen.